In all familiar with the fact that, in general, baseball teams have 27 outs to spend in any given game. Managers send out their players in what they believe will give the most return (in runs scored and runs prevented) on any given day in return for those 27 outs. Simple game. Dynasty Grinders has its own out-like currency. Each week you have 10 hitter positions that could be filled each day. 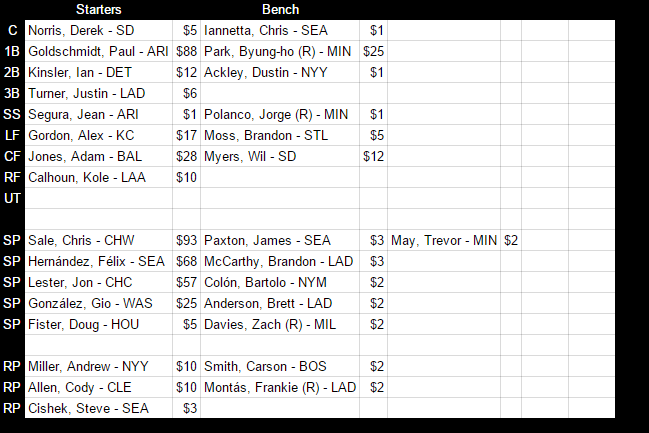 You also can fill three relief pitcher slots each day. Starting pitchers work a bit different, as you can only use seven starts each week, you have days with one or as many as five. MLB managers get the benefit of knowing they will have an opportunity to use all 27 outs. In head-to-head weekly fantasy, we don’t get that benefit. We have to deal with off-days, rain outs, day games, player rest days, and surprise injuries among others. We’re all facing the same struggle. That being said, we can construct our roster to mitigate these pains as much as possible. Thirty man active rosters give ample opportunity to have backups at every position. Perhaps with some creative construction, and depending how many pitchers you plan to carry, you could have three players deep in most cases. One point one five. 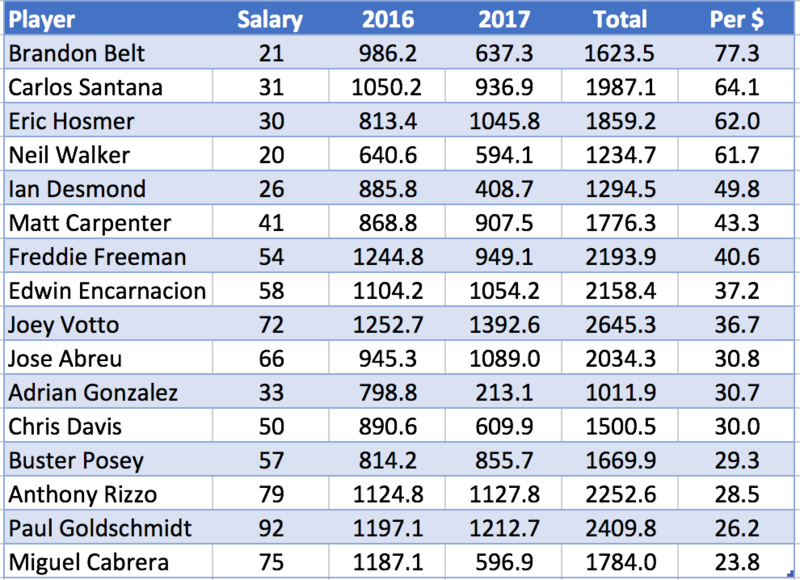 That’s what Steamer projections have the average plate appearance worth if you take the projections from the top 350 hitters in our league. So what does this have anything to do with platoon players or the elite tier? Elite players will average much more per plate appearance than 1.15. Mike Trout and Bryce Harper are both projected for over 1.8 points per plate appearance. They also do great things like finish games, play every day and are typically platoon proof. These are all great things. If you have a player like this, lock it up, toss him in with a replacement level player and you have one powerful punch on your roster. This also probably gives you extra flexibility elsewhere on your roster. Zero point nine five. That’s what Steamer projections have for the average plate appearance worth for the next 100 hitters. This is not an exact science, but as you can plainly see, the difference between what’s likely to be freely available and the typical average hitter is not a huge difference on this scope. At least not compared to what Trout and Harper mean. But, the difference has significance at the weekly level. Say, on any given week if you start replacement level players in any one position, you could count on something around 29 points scored. The average player in the same time scores 36 points. 7 points per week is significant. But, also consider the talent level of the players we’re discussing. I’m using 4.5 PAs per game x 7 games played. Better players get more PAs. Better players play daily. How many replacement level players do you need to get those seven days filled? Three? Mike Alives, Clint Barmes and company do play, they do perform to some degree, but we all know they’re not regulars. This is where platoons come in. If you are planning for them, even better. 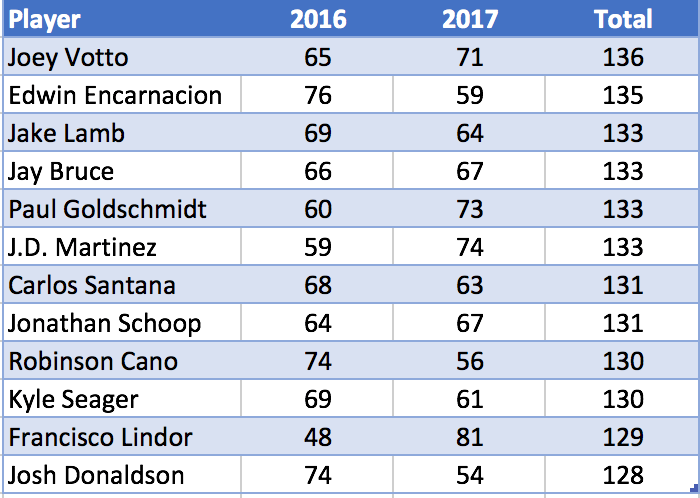 Just because overall these players might be at or around the 1.00 PPPA (points per plate appearance) mark, they might hit against lefties or righties at a much better rate. That matters. The clever manager could manipulate some tier 2 or tier 3 production out of some lower level talent by just using them when they’re in favorable positions to succeed. If you can afford the roster spots to juggle them around a bit, why not? Paul Goldschmidt and Miguel Cabrera are great, because they’re set it and forget it type players. And they’ll fetch a premium in the draft because of it. But there’s a plethora of really good players in niche situations that could be put into positions for you to take advantage of. You’ve just got to find them first.